If you live in the North you know rib withdrawal. You’re at the grocery store. You see beautiful spare ribs on sale for pretty much free. Your grill is buried under 3 feet of snow. It’s freezing out. It’s a conspiracy to make you crazy. Torture. Some grocery store exec is sitting sipping margaritas on a private island laughing. Just. Not. Fair. I say screw that. You don’t need a grill to make ribs great. Pork ribs are about low and slow. Braising is about low and slow. See where I am going here? Korean braised pork ribs. Ribs are a braising natural. I don’t understand why you don’t see more people doing it. Think about it. A little bit fatty? Check. Needs long, slow cooking to tenderize. Check. Meltingly tender when done right. Check. See where I’m going here? And the best part is the sauce. I am violently opposed to boiling ribs. That’s crazy talk. Seriously crazy talk. All that pork goodness down the drain. But here it gets concentrated in the sauce. Not down the drain. Every bit of flavour winds up in your mouth. Where it belongs. You need some Korean ingredients to make these. You need to get to know these ingredients anyway so make the trip to your local Asian specialty shop. Gochujang is a red chili paste. It’s not super spicy. But it is super tasty. Gochugaru is Korean red chili flake. Tasty. Not too spicy. It’s what they use to make kimchi. Pretty sure gochugaru goes into gochujang. Has me thinking about putting some gochugaru in miso. Watch for that soon. 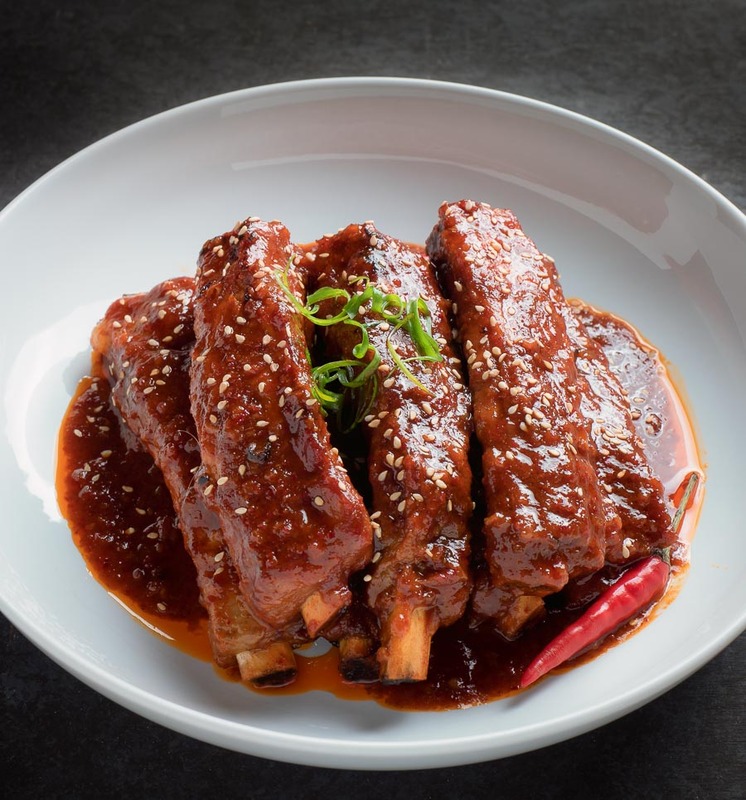 Korean braised pork ribs. Maybe they won’t make you forget you have a grill. But they will make waiting for snow to melt a whole lot more bearable. You don't need to grill ribs to make them fabulous. 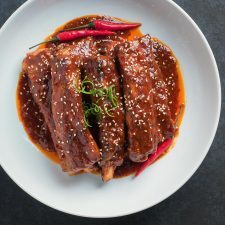 Korean braised pork ribs are great any time of year. Pre-heat your broiler. Coat the ribs with a bit of vegetable oil and lay them out in a single layer on a broiler safe sheet pan. Broil until lightly browned. Rotate the sheet pan to make sure they brown evenly. When they look good, flip them and repeat. Remove from the oven. Set your oven to 325F. Heat the vegetable oil in a large dutch oven over medium low heat. Add the onions and cook, stirring occasionally, until translucent. This takes about 5 minutes. Stir in the garlic and cook another 30 seconds. Reduce heat to low. Mix in the gochugaru, gochujang, shiro miso, mirin, soy, apricot jam and sesame oil. Stir to combine. Add the ribs to the dutch oven. Stir. The liquid won't cover the ribs. That's OK. Resist the urge to add more stock. Put a sheet of aluminium foil over the dutch oven and cover tightly. Place the pot in the pre-heated oven. After 30 minutes, remove the pot. Using tongs, move some of the submerged ribs up. Move the ones that were on the top down. Basically mix them up. Replace the foil and lid and return to oven. Continue to cook for another 30-40 minutes. Check at 30 minutes. They should be fork tender but if they aren't cook them another 10 minutes. Cook them until they are tender. Tender doesn't mean mush. Mush is bad. Tender means they pull away cleanly from the bone. Maybe a little tug to get them off but the bone winds up clean. Remove the pot from the oven. Remove the ribs to a bowl and tent with foil. Put the sauce in a large cup or fat separator and spoon off the fat. Return the sauce to the pot. Over medium heat, reduce the sauce until it's fairly thick - like a thin BBQ sauce. This should only take around 5-8 minutes if you resisted the urge to add more liquid while cooking. Return the ribs to pot and toss in the sauce. Garnish with sesame seeds. Serve with rice and a nice green salad. Or forget the sides and just mow down on ribs. In korean, main course, meat, pork. Bookmark the permalink. Made these on the weekend. Awesome! Soooo curious…who is the author of this fabulous recipe website? Thank you for saying that! I’m Romain and glebekitchen is my hobby. I do it because I want people to get into cooking from scratch. I love to cook, take pictures and write so it’s a lot of fun for me.